just purchased a 2010 Mac Pro, running High Sierra. It has 12 lovely cores. But, when I look at the CPU activity in the CPU History half of the rows are blank (image below). Does this suggest one of my CPUs isn't working? Each alternate line is a hyper threaded core, not a real core - count the lines, there are 24, not 12. If you're doing something processor-intensive, it makes more sense to use real cores, so tasks first share out to all the top line of each virtual pair. to the left - 2 simultaneous [yet separate apps] 3rd party app video conversions, still only the real cores needed - presumably the app threads according to the number of actual cores, for speed. If you add more tasks, they will start to add to the 2nd virtual core, but HT isn't as fast as 'real' for intensive tasks. to the right - a single conversion from Final Cut Pro, showing much better 'spread' of resources. I'm sure someone will come along with a better technical explanation, but in short - no, it's not broken, both CPUs are functioning normally, but maybe the software isn't fully using all the resources. I have no explanation for why FCP would work differently to 'regular' conversion apps, but the picture shows the difference. No, this is not an indication of anything being wrong with your CPU. You have a 2 x 6 core CPUs = 12 cores. There are 24 rows in your CPU history, and there's activty in 12 of them. I.e. every core is accounted for. The reason that you have extra rows are probably that your CPU supports HyperThreading. HyperThreading does not mean that you have double the amount of cores, but rather that in some (rarer) cases, the system might be able to run two operations at the same time on a single core. So everything is as it is supposed to be. Not the answer you're looking for? 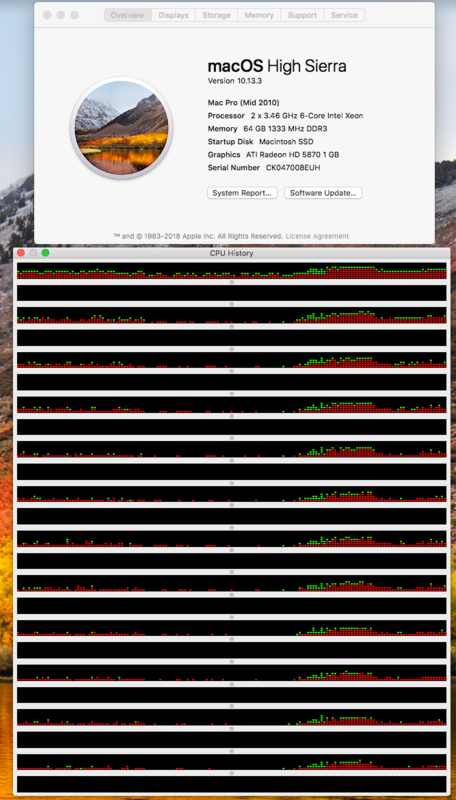 Browse other questions tagged macos high-sierra cpu activity-monitor . 2010 2.66 GHz 12 core Mac Pro not utilizing all 24 threads?